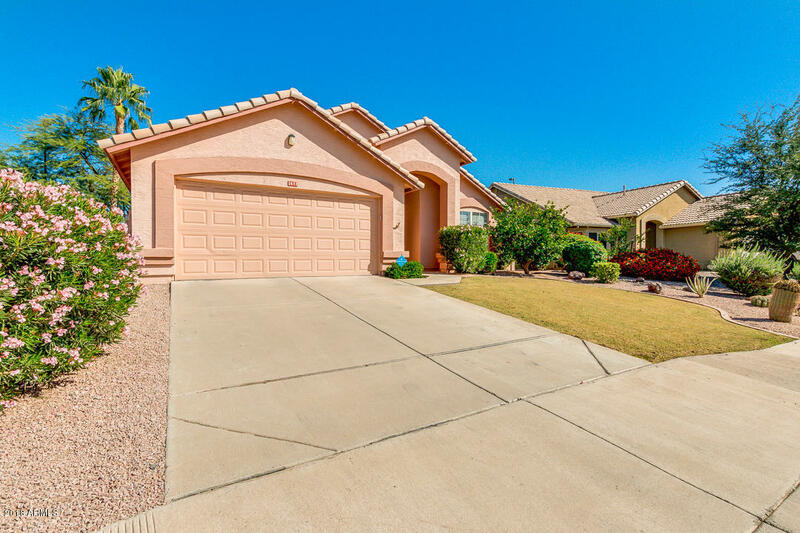 Fantastic 3 bedroom plus den, single level home with pool & 2 car garage for sale in Superstition Springs, Mesa, Az. Vaulted ceilings in master bedroom, kitchen, formal living, dining & family rooms. Ceiling fans, shutters & blinds, sun screens & dual pane windows make this home super energy efficient. Solar panels afford LOW energy bills in summer months. Island kitchen offers newer dishwasher, microwave & granite counters along with fridge. Washer & dryer convey. Back yard oasis offers lush grass, covered patio w/ fan & speakers, concrete deck area, fruit & palm trees, cactus garden and HEATED pebble surface pool with water feature. Other features include exterior paint with lifetime guarantee, water softener, new water heater, alarm system, newer carpet in bedrooms & custom front door.